Of all the things that came with the prep revival during the noughties, LL Bean’s duck boots may be the best of them. Dozens of things have come and gone from that era — many first described as classic, but couldn’t last past the prep craze. But LL Bean’s duck boots have a kind of versatility that’s hard to beat. They go with jeans and cords, Barbour jackets and French chore coats, tweeds and casual overcoats. They work with almost any wardrobe that can be considered vaguely classic. They’re also some of the best foul-weather boots you’ll find anywhere. Originally called Maine hunting shoes, they were designed for outdoorsman tramping around the countryside. They have a fully waterproof rubber construction, which wraps around the top of your foot, while the shaft is made from leather. And they have that better-with-age quality we love. I leave mine out on my back porch during the summer cause I think the leather looks better when it’s sunfaded. LL Bean boots run about $150 shipped, but from now until Tuesday, the company is having a 25% off sale (just use the checkout code FALL25). That puts these at about $100 to $110, depending on the model. And while the company’s return policy isn’t as good as it once was, they still guarantee product satisfaction for up to one year. 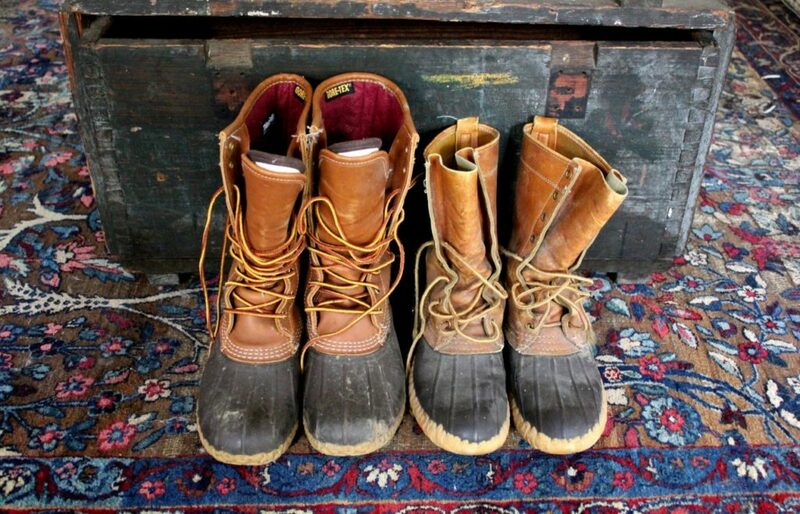 Height: Bean boots come in different heights, from slip-ons to towering 16″ hunting shoes. Most people opt for the tan 8″ model (which is what we’d recommend). It’s tall enough to protect you from slushy roads, but also easy to lace-up. For friendlier damp weather, you can consider their gumshoes. Lining: Your standard pair of Bean boots is unlined, but if you want something you can wear below 30 degrees or so, you may want a lined pair. LL Bean makes them with Thinsulate, Thinsulate + GoreTex, and shearling (listed in order of warmth protection). Just note that some people report their lined boots feel a little too warm in non-freezing temperatures. Sizing: The standard advice is to go a full size down in the unlined version (or 1.5 sizes down if you wear half sizes), but to take your regular size for lined models. I don’t have any experience with the latter, but can confirm that you’ll want to go a full size down in the unlined boots – even if you plan on wearing these with thick socks. How to Wear: Bean boots go great with parkas, waxed cotton Barbours, duffle coats, and almost any kind of workwear (from standard Americana to quirkier Japanese reinterpretations). Wear them with jeans, chinos, and Shetland sweaters. They offer a lot more protection in the snow and rain than your standard pair of leather boots, but are easier to wear than Wellingtons.